This post originally appeared at Route 41 Resurgens, my new sports blog. 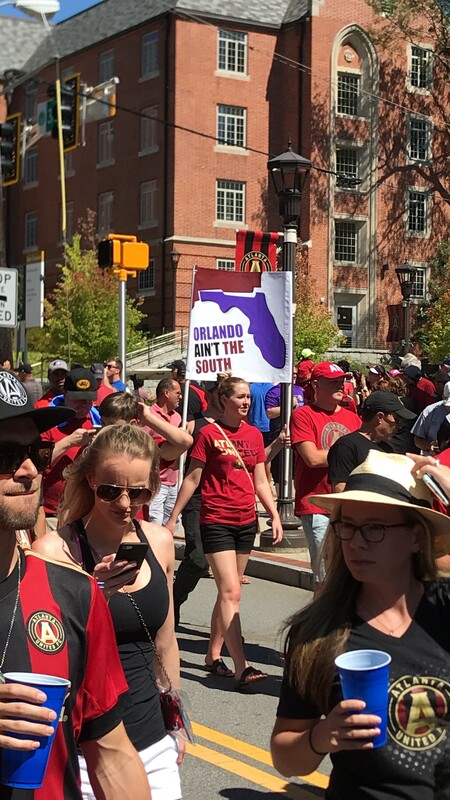 Orlando City vs Atlanta United is not a rivalry. There, I said it. I even put it in a cool font with some spacing to make sure you got the point and I didn’t bury the lede. Two games does not make a rivalry by any stretch of the imagination, but if you listened to anything put out by MLS head honchos in New York City or even Atlanta United’s own marketing team in the last two weeks, you’d think Atlanta fans are salivating at the chance to take down their bitter and most-hated rivals from DisneyWorld. Let’s take a short detour to talk about rivalries for a second. Georgia Tech vs Athens Community College — rivalry. FC Barcelona vs Real Madrid — rivalry. New York vs Boston — rivalry. Each of these series focuses on a conflict. For Georgia Tech and Athens, it’s a battle for the state of Georgia. For Barcelona and Madrid, it’s a proxy for the tension between the wishful secessionists in Catalonia vs the seat of the Spanish crown. For New York and Boston, it’s a fight between big and little brother in the Northeast. MLS is only 22 years old at this point, so its rivalries aren’t the 100+ years of hate we see froth over in the three series I named above. Every move MLS makes is carefully calculated and meticulously executed, and this includes their creation of rivalries. Most rivalries MLS has backed have been created for marketing purposes by the head office in NYC. There are some that are really headscratchers: Toronto vs Columbus for the Trillium Cup (what even is a Trillium? ), Dallas vs Chicago for the Brimstone Cup (which makes more sense if you remember that Dallas was originally named Dallas Burn) — the list goes on (literally). In more recent years, MLS has carefully plotted out expansion to other regions and either absorbed existing rivalries or established new ones through the placement of the new team. Look at Portland vs Seattle (and sometimes Vancouver) for Cascadia, Houston vs Dallas for Texas, NYC vs Red Bulls for New York — all of these series have a central conflict that fuel the underlying spite and animosity between the clubs involved. MLS looks at the establishment or continuation of rivalries as a tool to grow the game in the US, and — to be fair — that’s not a terrible way of going about it. But what is a terrible way of going about it is trying to tie together two teams that barely have anything in common, like Atlanta and Orlando. What is the central conflict here? The media has propositioned this series as a “battle for the South”, but it’s well-established that Florida isn’t part of the South. Hell, the common refrain around these parts is that “the more north you go in Florida, the more South you get”. But nevertheless, MLS seems intent on making this series a rivalry, so why not play along a little bit to placate the 1-percenters? TL;DW: In a very evenly-contested match, Villalba helps Atlanta steal 3 points at the death at Orlando, sending 25,527 Mickey Mice home sad. TL;DW: Atlanta steals a point at home at the death (again) despite Orlando’s best efforts to maim and anger its players, sending 44,000+ red-, black-, and gold-clad fans home satisfied with a draw that felt very much like a victory. Kaká launched a rocket of a ball that rifled past Guzan into the net, but Villalba got the last laugh once again, skewering the hearts of Orlando fans late into the game and getting OCSC fans at The Mane Land to admit they felt a tinge of Rivalry Hatred™️ for Atlanta. Well, Orlando still flounders for the most part without occasional flashes of brilliance from Kaká and Cyle Larin. Brad Guzan has drastically improved Atlanta’s defense, but it’s still prone to lapses. Atlanta has a finishing problem without Josef Martinez in the starting XI. But most importantly, we can start thinking about Atlanta vs Orlando as a rivalry, albeit in the weakest possible sense of the word. I was in Bobby Dodd Stadium for game 2, and I admit — after Kaká delivered that screamer of a goal, I felt a tinge of hate for Orlando. Atlanta had been playing so well at home, and the Lions were about to stick a massive fork in that. Boos rang around around Bobby Dodd Stadium whenever Orlando goalkeeper Joe Bendik touched the ball after some early game theatrics, and he continued to be a massive pain in the neck for the rest of the game. Orlando midfielder Cristian Higuita and Villalba almost got into a fight at midfield, and the conflict almost broke out into a brawl until referee Allen Chapman (who called an ok game overall) showed both players yellow cards for their antics. Bendik made an unnecessarily dangerous save on Greg Garza in the box that drew the ire of every Atlanta fan in attendance (and should have gotten Bendik sent off, I might add). There was hate in this game, regardless of whether it was manufactured or not. Tempers flared both on the field and in the stands, and the match lived up to the intensity that MLS propped the series up to have. If these two teams can play every game between them like this for a long time, then we’ll have a true rivalry on our hands. But for now, don’t call it one just yet.